Description: I have to admit I am not a gardener; no green thumb have I. This drawing most likely looks like a garden I would have - wild and all kinds of growing things. (Some have commented that this looks to them like some kind of pre-historic garden!) 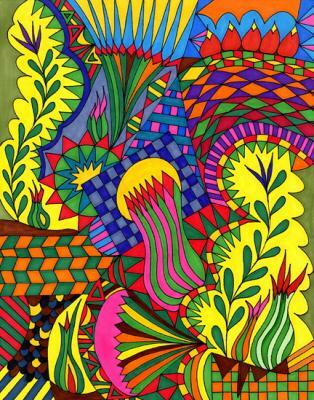 When I look at this drawing I see wild plants, vines, flowers, fruit, all growing without definition or purpose. I also see several garden walk ways without connection or direction, all going no where. Maybe this is a commentary on a life without purpose; without the Lord?